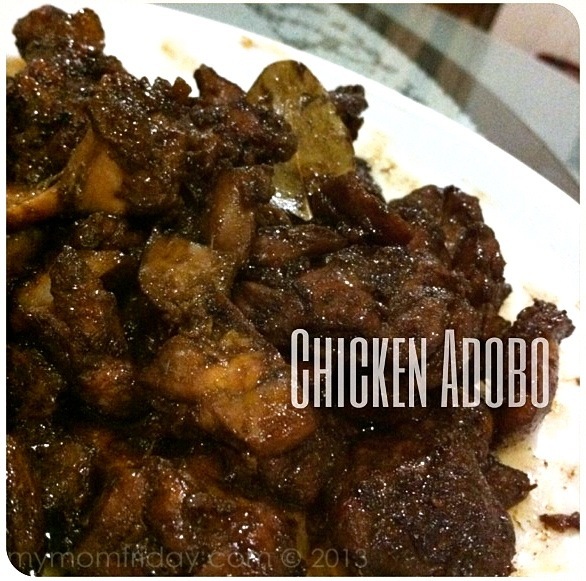 Adobo. The unofficial national dish of the Philippines needs no further introduction. It's probably the most cooked, most popular comfort food and "ulam" in the country. It's a meat stew, sometimes for seafood or veggie too, cooked in garlic, vinegar, and soy sauce. 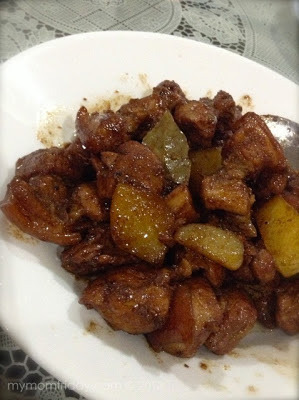 I've made a few versions of pork and chicken adobo since I got married, including the Chinese-style hong-ma with a more sweet-salty thick sauce. But this version is a personal favorite. Please excuse my photos since they were all captured with my iPhone - not intended for the blog, but for Instagram only. (Click on each image and you'll see the IG post.) 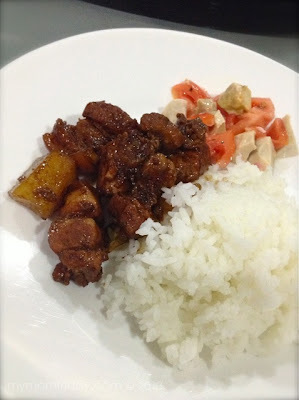 I shared the pork belly adobo, chicken adobo (bone-in), and boneless versions, and a number of friends have asked about them, seeing they are darker in color and with almost no sauce. As I've mentioned in past Mom-Cook posts, I never measure and just eyeball the ingredients. You have to taste mid way though cooking. Sometimes, I intentionally measure just to be able to share a more accurate recipe for the blog! 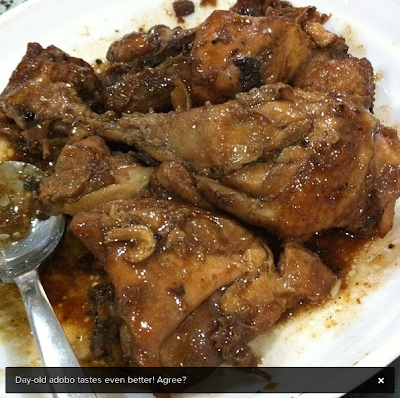 =) Part of the inspiration for this particular recipe is the chicken-pork adobo of my former boss, who recommended the use of balsamic vinegar. Heat oil in pot at high heat and quickly sweat the garlic. Don't let it burn. Add the meat and sear for about 2 minutes on all sides. Then lower heat. Pour soy sauce, balsamic vinegar, sugar and pepper. Mix until well coated then cover pot. Cover and simmer for another 15 minutes or until meat is tender. My family, especially the kids, prefers boneless chicken since it's more tender and easier to eat. For boneless chicken thighs, total cooking time is up to 30-40 minutes, depending on cut size. For regular chicken cut-ups, cook for about 45 minutes. For pork belly, cook 60 minutes or longer, depending on cut size. Heating leftovers make this adobo tastes even better! Serve with steamed or garlic rice. It took me about 2 tries to achieve this dark color I want for the meat, then another batch wherein I added potatoes (below) midway, but was not as dark. Still, I'm satisfied with the marinade, giving it a deep soy flavor. 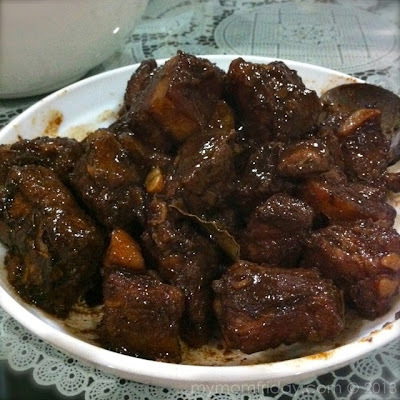 The fragrant balsamic vinegar is not sour at all and cuts the saltiness of the soy sauce, as with the brown sugar, lending a subtle sweet-tart taste to the adobo. Best served with a side of salted duck egg and tomato drizzled with vinegar. Winner!